For Cecelia Maria Haberdasher, the young protagonist in “They Called Her Vivaldi,” the homemade helmet she describes so poetically is her security blanket — with benefits. Not only does Capello protect the sensitive agoraphobe from the bluster and noise of Triste, the imaginary Italian city of yore where she and her widowed father, Edward Haberdasher, live and run a general store, but like a musical X-ray machine, it also enables Vivaldi to “see” the songs playing inside their customer’s heads and create a musical sketch of that person’s idiomatic melody. Those made-on-demand compositions become the devoted duo’s best-selling commodity. Hence Cecelia Maria’s nickname, Vivaldi. “They Called Her Vivaldi” will be performed Sunday, March 24 at 3 p.m. and Monday, March 25 at 10 a.m. at the Smith Opera House in Geneva as part of its ArtSmart Educational Theatre series. The one-hour live performance is designed for audiences ages 7 through 77, and will be followed by a Q&A. “Even as adults we all have crutches or props we rely on–think water bottle or cell phone. They inveigle our way. 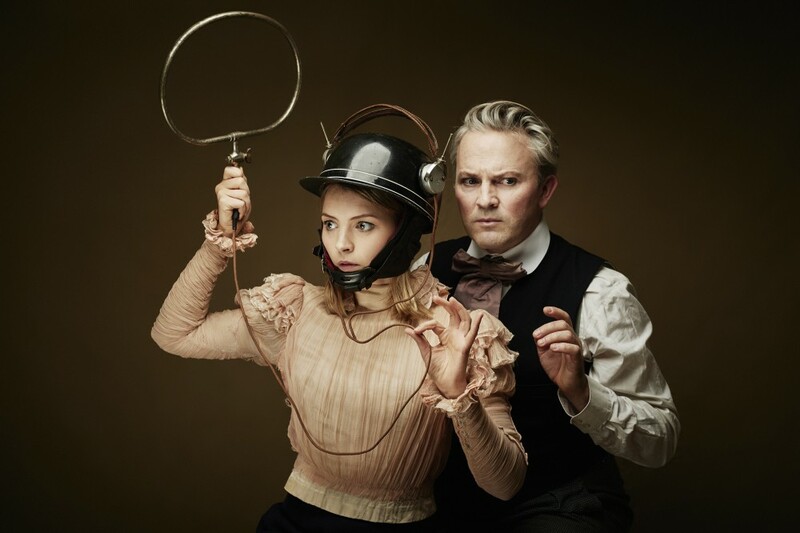 It is good to challenge that sometimes,” says Irish playwright and actor Louis Lovett, artistic director of the revered Dublin-based theater company Theatre Lovett, which is currently touring North America. When Capello is stolen, Vivaldi’s musical talents evaporate. Determined to reunite with her “head fellow,” she sets out on a wild adventure of self-discovery through the dark canals and cobblestone streets of Triste. Along the way she forges comic connections with a scissor-free hairdresser, a salt-deprived pizza maker and a paddle-less boatman. And Vivaldi has an epiphany. Losing something dear to you is not the end of the world. In many cases, it’s just the beginning. While Theatre Lovett’s mission is to engage children in the magic of live theater, it clearly sets no age boundaries. “I see it as a triangle of love between performer, adult and child. There is this connection where as an adult bringing a child to the show, you look out of the corner of your eye and see the child’s enjoyment. What that does to you as an adult is gorgeous. The child observes the adult as fully engaged — belly laughs, tears in the eye. For the child to see that is great validation. Then the performer enjoys the response from the two ages, and you have a win-win-win,” says Lovett. And what about grown-ups who show up without the kids?